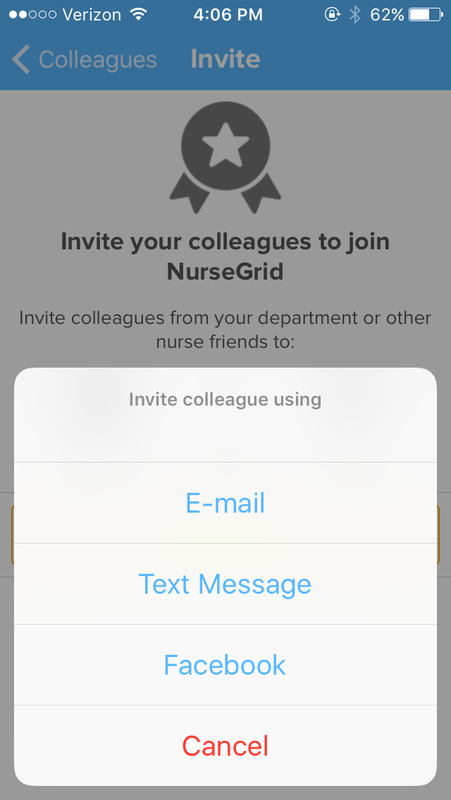 If you've already searched for your coworkers and friends on the Colleagues tab and don't see them listed, they may not be using NurseGrid yet! Send them an invite by pressing the "+" icon in the top-right corner of your Colleagues screen. On the Invite screen, press the yellow "Invite Now" button and select how you'd like to invite your coworkers - through email, text message, or Facebook. Your phone will automatically open the invite method you picked and populate a message for you with a NurseGrid download link. Just send this off to all of your nurse friends and colleagues and they'll be able to download the app just by clicking that link!